Jim Cramer: technology company Cisco out with strong results. Tremendous guidance, frankly. It continues to be more of a software company, of late, than a hardware company. Joining us from San Jose is CEO, Chuck Robbins. Chuck, congratulations on a monster good quarter. Robbins: hey, Jim. Thank you. Good morning. And hello, Carl. Good to be here. Cramer: all right. Now let’s get right to it. When I listened to the conference call, I said to myself, this is not a hardware company that sells routers and switches, although it still has that. This is a software company that manages to have much better margins and is really on fire. Are you more of a software company? Chuck Robbins: well Jim, if you look at the quarter, first of all, I think we laid out a strategy a few years ago where we were going to continue to evolve and add more software assets to the company, deliver more of our technology in the way that our customers want to consume it, as SAAS offers, and I think clearly that strategy’s working given the results that we put out there. Our -- you know, as our customers navigate this new multi-cloud environment that they’re operating in, the product innovation that we have delivered to help them with this next generation infrastructure is clearly resonating with them. We saw our infrastructure systems up 7%. We saw applications up. 10% securities up 12%. And then the transition that we put in place from a software perspective is working, as well. Our total build and unbuild deferred software revenue was up 28% year over year. And our product orders were up 7% year over year. Sp overall it was a good quarter and I think that the strategy is working and the transition is actually moving forward. Cramer: chuck, you made a series of acquisitions within the last couple years, since you took over. To me, I was not clear about where they were going but they really did kick in entirely this quarter, didn’t it? Robbins: well, Jim, if you look at what we’ve done, first of all, I want to just give incredible kudos to the team who’s built some amazing internal innovation. You know, we delivered this intent-based networking architecture last summer. And the catalyst 9,000 which always carries a software subscription on top of it, as I’ve said before is the fastest ramping product in the history of the company and last quarter just continued that momentum. So our teams have built some incredible innovation. And at the same time we’ve added to that, through these acquisitions, most recently we announced our acquisition of duo, which is going to provide a critical part of our security architecture going forward around identity. So if you look at that, if you look at app dynamics and the success we’re having with application analytics, with infrastructure analytics, these applications are playing a key role in addition to the great innovation that our teams have built. Cramer: chuck, there was a moment on the conference call where your Kelly Kramer excellent CFO actually says I think the environment’s very strong. Now she’s speaking about Europe but Cisco a big company. The world has to be better not just united states if you’re putting up these kinds of numbers. Robbins: well, Jim, if you look at what we’ve experienced over the last few quarters, I heard Larry on earlier on CNBC, and he talked about the economic expansion that we’ve seen. And this quarter from -- it was broad-based for us. We saw, you know, our order growth across Europe, across Asia, the Americas, was all – you know, it was 6%, 6% and 12% across all of our customer segments. Our enterprise business grew 11% this quarter, and orders, commercial was up 9%. Public sector, 1%. And our service provider sector came back to 6%. Emerging countries was up 12%. So it was a broad-based you know, performance. And it is a combination of two things, as I said on the call yesterday when I was asked about this: we have clearly created a great deal of innovation and momentum with the solutions our customers are looking for, and at the same time we have the benefit of what we’ve seen from a very strong economy around the world. Cramer: alright, chuck, one thing -- I’m not nitpicking but I am confused. You talk a lot about molding cloud strategy from what the customers want but I really don’t get an amazon web services aspect. I don’t get azure. I see you’ve got a good relationship with google but we know they are a distant number three. I didn’t hear a lot about -- say a combination with VM Ware which does a lot of onboarding. What are you doing to make it so you are more agnostic and less focused on a google cloud? Robbins: yeah, Jim, we have announced already a partnership with Microsoft. We’ve been doing work on hybrid cloud offers, into azure. We announced support for azure stack over a year ago and our teams have been working on that technology. We’re doing security work together. And by definition when we say multi-cloud, you can assume that we are working on enabling our customers to deliver security and policy from their private infrastructure into any cloud that they choose. So you can assume that we’re going to enable that across any public cloud, any SAAS provider, as well as extending the network out to the edge with this massive influx of IOT devices that our customers are seeing. So we are going to engage on all fronts. Carl Quintanilla: hey, chuck, I always hate to go macro on you but just forgive me this one time. It’s been such a crazy week with the market obsessed with emerging markets and dollar denominated debt. I know it is early, but -- just shine a light on it from your point of view and does it make the current quarter guidance any cloudier than it otherwise might have been? Robbins: well, Carl, I’d be shocked if you didn’t go there. So, it’s -- look, right now if you look at the things that are going on around the world, even in the last few weeks, we certainly see the strengthening dollar which typically leads to some stress in emerging countries. We’ve seen what’s going on in turkey. We’ve seen over the last few quarters what happened in Argentina. We’ve got the trade dynamics going on on a global basis right now. So there -- there are issues out there that we’re watching very carefully. And that certainly we aren’t immune to. But you know, based on what we know today and what we see in our business we called what we felt for next quarter from a guidance perspective and we’re just proud of what our teams have done. Cramer: alright, chuck, we know -- you and I know we are looking for say long-term dynasties, kind of -- like eagles versus the setting dynasties of the falcons. 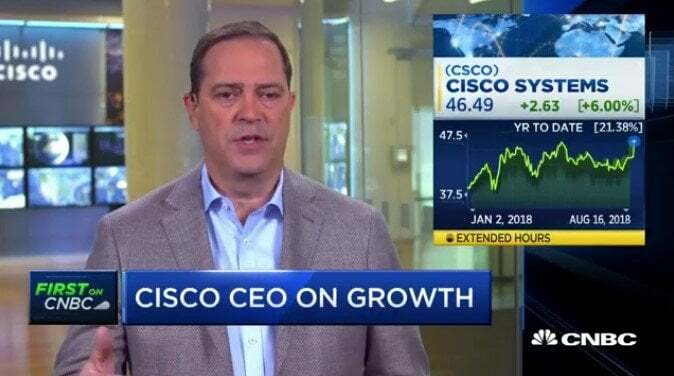 I want to just mention – the "Wall street journal" writes, over the longer term, Cisco will remain challenged by the mature nature of its largest businesses. How do you respond to that? Robbins: well, I think that same article was written a few years ago, as well. So we have made a lot of progress. We’ve brought innovation back into the core network with software subscriptions that are, you know, renewable over time. I think we are introducing more predictability into our business model. So I would say much like the resurgent falcons, or maybe even the resurgent 49ers, you know, I’m very confident in the role that we’re going to play with our customers in the future, Jim. Cramer: -- look, we do have a lot of noise in the background. One last question – we do have a lot of noise in the background. 5g was the theme on the call. 5g is just beginning. To me that says that Cisco run is just the beginning. What do you think of that analysis? Robbins: well, Jim, when you think about 5g, the promise of 5g is to create significant high-speed connections at the edge of the service provider network, which in turn just logically requires a great deal more capacity in the core of their networks which is where we play. So we’ve been having discussions. I’ve talked about it starting at mobile world with these large customers around the world, relative to how their networks will evolve to accommodate all this traffic that they’re going to see coming on their networks. And so we think that’s going to be a nice growth opportunity for us, I have said that we’re in the early stages of discussions and customers will begin to deploy at various states. But it will definitely be a significant upgrade cycle with service providers over the next few years. Cramer: well, once again, congratulations, chuck. And I share your stock is very very inexpensive versus the growth that you’re putting up. That’s Chuck Robbins, he’s chairman and CEO of Cisco. Thank you so much, chuck.